Let’s face it: There are some aspects of wedding planning that are less fun than others. Even the most happy-go-lucky bride can lose her patience when bills are mounting, tensions are heating up between parents or the bridesmaids, and weekends/vacation days are nonexistent (they’re reserved for vendor appointments). We can empathize! We've rounded up some of the most romantic wedding moments that make us want to say “awww,” because as stressful as wedding planning can be, it’s all worth it to marry your best friend. That moment when your husband sees you for the first time as you walk down the aisle towards him makes every second of wedding planning worth it. This is such a priceless image! A sweet note is the perfect way to begin the day. I vote for a first look that is sure to capture a priceless moment! This bride is practically toppling over with excitement (and Eskimo kisses). Every bride secretly dreams about the kiss that officially makes them a Mrs., and this dip-kiss is everything a girl could ever hope for. Walking down the aisle as husband and wife while being showered with rose petals. Pack tissues just in case. How cute is this? A bride and groom pinky swear after their wedding vows! Have a little fun and enjoy your newly minted status as wife with a bike ride during cocktail hour with your new husband. What a guy! Sometimes a girl just needs to be carried away. Time stands still with this bridal party pose. 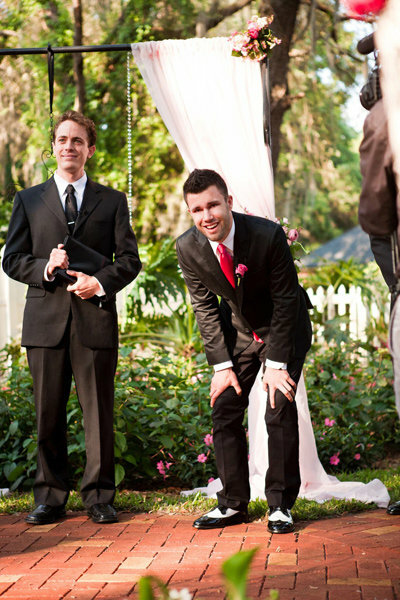 Savor a quiet moment, like this stunning couple going for a swing during their wedding. A moment of prayer is a beautiful way to start your marriage. One of my favorite moments at this “Dinner and a Movie” wedding by Patrick and Tricia Hadley was this shot of a bride and groom sitting together on a bench. Some of the most touching words you'll ever hear on your wedding day are during the toasts. That candid moment where your husband wraps his arm around you at the reception. Sometimes, no other seat will do but his lap. Is there anything more romantic than kissing in the rain under an umbrella? This photo makes a light drizzle more bearable. We stand corrected: This shot of a groom holding his jacket over the bride's head is even more swoon-worthy. The “veil kiss” is a favorite must-have photo with brides, and this one is especially dreamy. After you celebrated the best night of your life, it's safe to say that a sweet exit like this one is an idyllic way to start your happily ever after. This couple even took beverages for the road!